A few months ago I reviewed Fistful of Hops Fall Release. Now we have the Winter IPA by the guys at Sun King. Fistful of Hops addresses the difficulties of getting hops year round, by using the same malt bill in each version but changing the hops up by season. This makes the IPA different each quarter, but still kind of the same. It's a really cool experiment related to how changing the hop profile completely changes a beer. I was a big fan of the fall release as you can see in the post linked above, and had high expectations for the winter release when I heard it was going to feature Chinook and Centennial hops, because my homebrew IPA uses a ton of Centennial hops. I think they are the classic IPA hops, and no matter how many cool new varieties come out it will always hold a special place on my tongue. This one is a lot like the last release, nice smooth light malt bill with a big old "fistful of hops." It pours out a beautiful light golden color with a thick white head on top. It smells awesome, with a huge hit of that Centennial hop citrus aroma. This release was super smooth. The malts and the hops complimented each other nicely. There was just enough bitterness to let you know it was a heavily hopped beer without being over powering. Now don't get me wrong, this beer has 70 IBUs and is by no means a malt forward beer. It has a really nice heavy hop profile, but the specific blend has a lot of flavor without too much bitter kick in the teeth. Some of you might appreciate that, others might not. Now to kick it up a notch, we decided to run Fistful of Hops Winter through the Randall. For those of you who don't know what a Randall is, its a term for a hop infuser. It is like making tea. You have a "water bottle" like device with a strainer on top of it. You put whatever you want to infuse your beer with in the bottom then add the beer. You let it sit like this for fifteen or twenty minutes to soak up some of that added flavor. A lot of breweries use them to give their IPAs a big fresh hop kick. We used Dog Fish Heads Randall Jr. but instead of filling this contraption up with hops, we used fresh grapefruit, since we all love the Grapefruit Jungle by Sun King. Using a Randall doesn't always make your beer better. You can get some really weird combinations, but this time we hit gold. The infusion blended perfectly with the already existing IPA. The grapefruit added a subtle yet bright sweet and tart flavor. It played off the hops nicely and really turned out wonderful. If you don't have a Randal, you can get similar results from a French press coffee maker and even soaking your beer than straining it. The Randall really made this beer shine big time for me. On its own though, I would give it a solid 4. The BrewniBomber: A lot of breweries having been playing with "single hop" beers to highlight how hops varieties are so different. While this is not quite the same, I'm glad to see Sun King experiment with a "hop series" of their own, especially using an IPA recipe (I think SK does IPAs well, but hasn't done enough regulars). This beer pours copper with gold highlights and a fluffy 3-finger off-white head. Leaves some lacing behind, but less than I would've expected. Taking a whiff I get pine, herbal notes, grapefruit... and do I smell a bit of smokiness? Sipping gives grapefruit and a nice bready malt before finishing with some flowery bitterness. The smokiness is still there and reminds me of a bit of peat (Chinook?). I would never call this beer "smoky" and this isn't a major note anyway- it's just barely there, but adds something distinct. 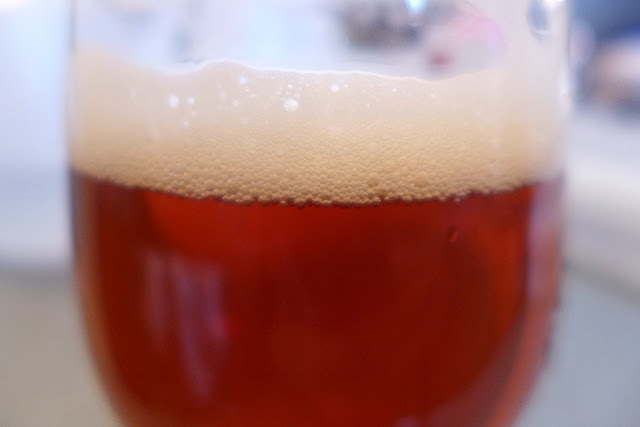 The mouthfeel is light and clean with good carbonation before finishing slightly dry. I generally prefer my IPAs to be more citrusy (I liked our Randall version better), but this beer is so well balanced with a clean hop bite that it's hard not to like it. The (very) light herbal smokiness I get may be all in my tongue, but it's interesting. 4/5. The Fistful of Hops Winter Release featured Centennial and Chinook hops, which I generally associate with overly bitter beers. Unfortunately, the Winter Release was no exception; the bitterness overpowered most of the other flavor. I much preferred the Fistful of Hops Fall Release, and I'm looking forward to what the other seasons bring. However, I do agree that our Randalled version worked very well, making the bitterness less overpowering. Randalling the Fistful of Hops Winter Release with grapefruit improved my rating by more than a full head. For more reviews and other perspectives about this beer, check it out on Beer Advocate.